Will the insurance company help me to get back to work if I have income protection? Ahh yes, a very good question indeed and an important one too for anyone that is looking to purchase the best income protection in Ireland. 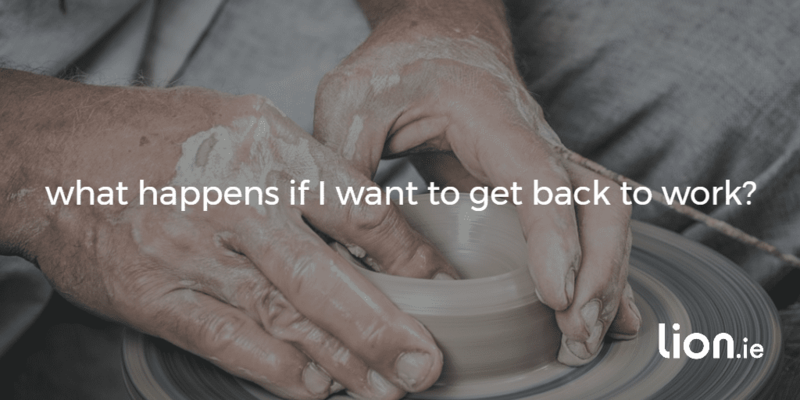 And because I get this question so much, today I decided to write an article explaining to you the potential pros and cons of each income continuance provider when it comes to getting you back to work. Some people fixate on the chances of their policy paying out, I think this is a waste of energy. If you can’t work due to a medically recognised illness, your policy will pay out. On average a whopping 94% of all income protection claims were paid last year. The smart people are more interested in how their insurer can help them get back to work. Work is a huge part of your life. When it’s taken away, it can lead to all sorts of problems, from boredom to depression. 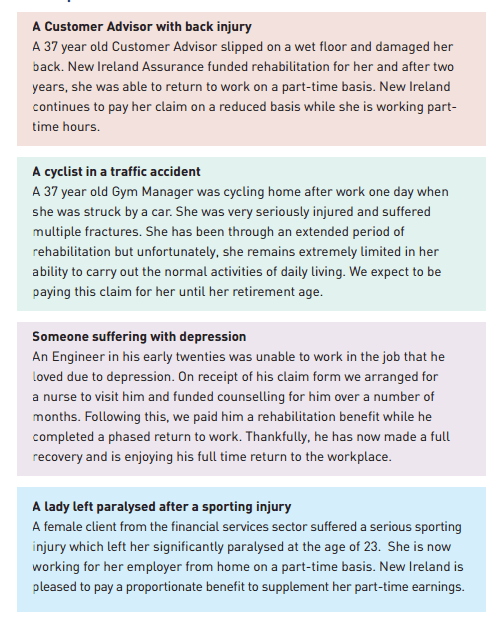 So let’s look at how the various insurers can help you get back to work. But first, let’s be clear that although it’s in the insurer’s interest to get you back to work, they will never force you to go back if you’re not physically or mentally ready. Friends First believe your income protection policy should go beyond providing you with financial protection. That’s why they include additional services in their policies to help you with your recovery. Hopefully you’ll never need these services but if you do, they are available. They will cover also any expenses that may arise such as travel and accommodation so you can take advantage of the benefits without worrying about costs. You’ll have the peace of mind that when you contact that person, they will have a complete understanding of your case. The Care Pathway Service offers access to cognitive behavioral therapy (CBT) with professionally qualified and experienced therapists with a focus on returning to work. The cost of this programme is paid for by Friends First. Friends First developed this programme in conjunction with Talent Fusion who are specialists in human resources and career transition. The objective is to help you seek a new career or alternative employment if you can’t get back to your normal occupation. If you return to work at a lower salary, Friends will pay you the difference between your old and new salary depending on the amount of cover you bought initially. If you return to work on a part-time basis, they will pay you the balance of your full benefit so you can maintain your standard of living. 38 year old forklift driver had been out of work following an accident at work where he hurt his back. With support from Talent Fusion, he has retrained as a chef working in a college. Helping Hand is an additional service offered with all Royal London policies and provided through its partners RedArc. It gives one‑to‑one personal support from your own Nurse Adviser from RedArc who can help you and your family cope with being unable to work. Whilst your medical team focus on your treatment, RedArc helps by providing ‘softer’ skills – a friendly listening ear, practical information, and much needed emotional support both for you and your family. For example, managing stress around a return to work is one area Helping Hand can help. RedArc nurses are trained to provide practical stress management advice. They can also support family members suffering the effects of stress and anxiety. or physiotherapy for serious health conditions. It can be tough adjusting to full time work after you have been off following a long‑term claim. This is a partial benefit payment that may be payable if you return to work on reduced earnings. For example, if following a claim you need to return to work on a part time basis or in a different role at a reduced salary you may be eligible for a proportionate income protection payment to help make up for some of those lost earnings. This payment, if eligible, will continue either until your health improves sufficiently that you can return to full‑time work or you reach the expiry age on your policy. With Aviva income protection plans, you have access to Best Doctors. You can use the service to get advice/opinion on any chronic or troubling ailments affecting your quality of life or for the condition/sickness which has given rise to your income protection claim. 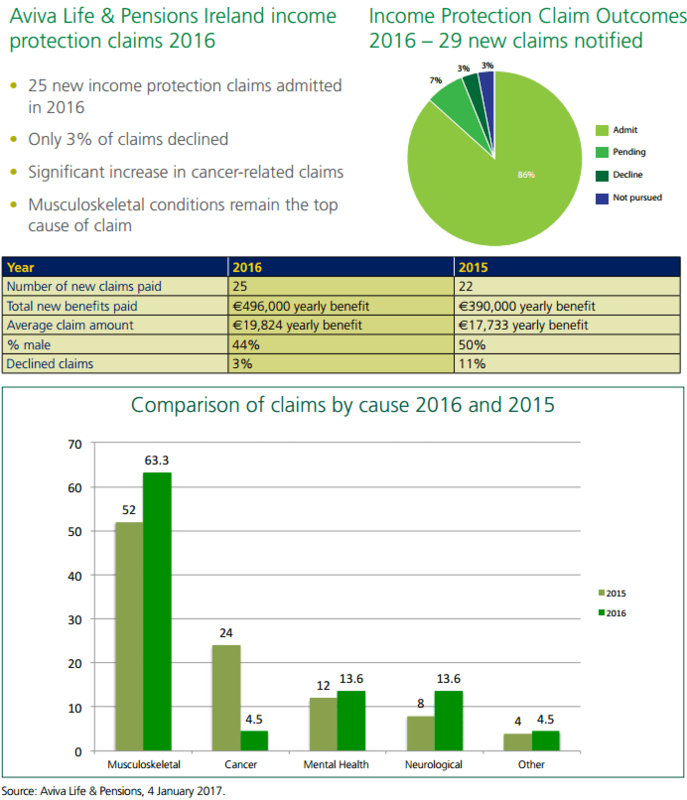 The most common causes for claim in 2016 was for musculoskeletal (back/joints/muscles) related conditions and cancer, both of which you can refer to Best Doctors for their opinion. 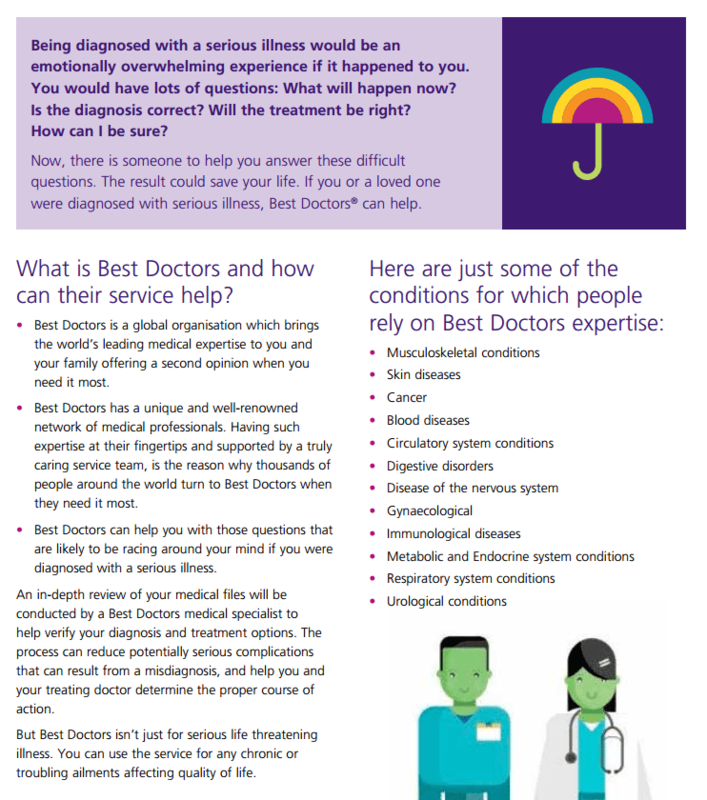 If you have claim, Best Doctors gives you peace of mind knowing your condition has been properly assessed and considered by one of the top medical professionals in the world. Similar to Friends First and Royal London, Aviva may compensate you for reduced earnings if you are unable to return to your original role at work, and have to undertake a lesser role at a reduced salary. This benefit is payable for a maximum of twelve months. If you are forced to change job completely, working full-time but for a reduced salary, Aviva may also compensate you for those lost earnings. and 25% of your monthly income protection payment in month 2. New Ireland provide access to professional support to help you return to work. Similar to the other insurers, New Ireland also facilitate those who return to work on a part time basis through their proportionate benefit. New Ireland work closely with you to help you continue to carry out normal everyday activities, and ultimately return to work. Other supports that may be available include counselling, physiotherapy and re-training all of which are designed to help you back on your feet and working again. NurseCare: gives you access to two confidential helpline services provided by Intana Assist. MedCare: access to a Medical Second Opinion service from MediGuide. You can have an independent review of your diagnosis and treatment plan from one of a range of leading medical centres around the world. 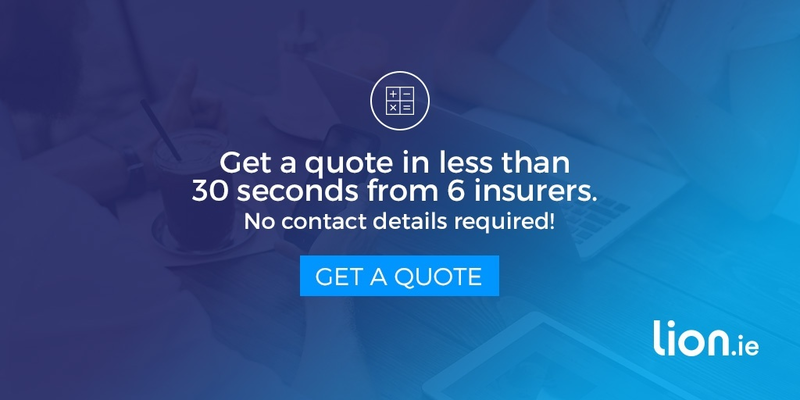 ClaimsCare: access to an expert claims service and a post-claims counselling service with the Clanwilliam Institute to help you through difficult times when you’ve had a claim. If, you return to work part-time or to a lower-paid job, Irish Life will still pay part of the benefit if they are satisfied that you are still not able to do your normal job. You now know more about income protection than 99% of the people in Ireland. As I see it, you’ve got three options. 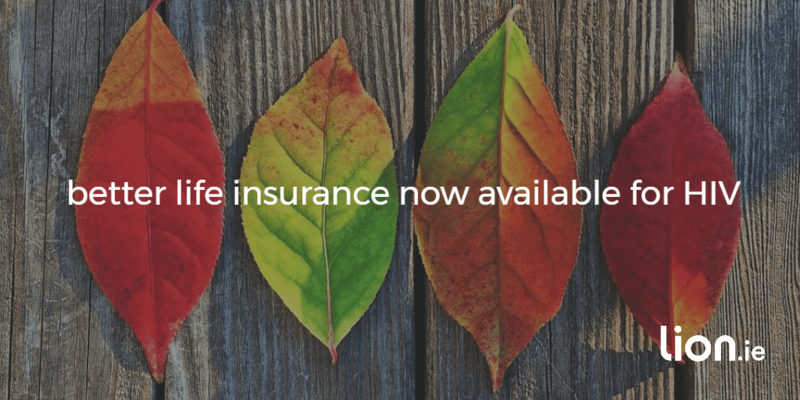 If you’d like to get an instant income protection quote, click here. If you’d like me to help you arrange your cover or have any questions, give me a quick outline using the form below or call me on 05793 20836. If you have HIV and applied for cover before 2013, you should reapply. The insurer may have offered you cover at a ridiculous price over a short term. Competition in the market means longer terms and lower prices are available.